The mobile gaming market is full of quirky and eccentric titles, often available for mere pennies on the dollar, but there is a surprising lack of such options on the Playstation Vita. 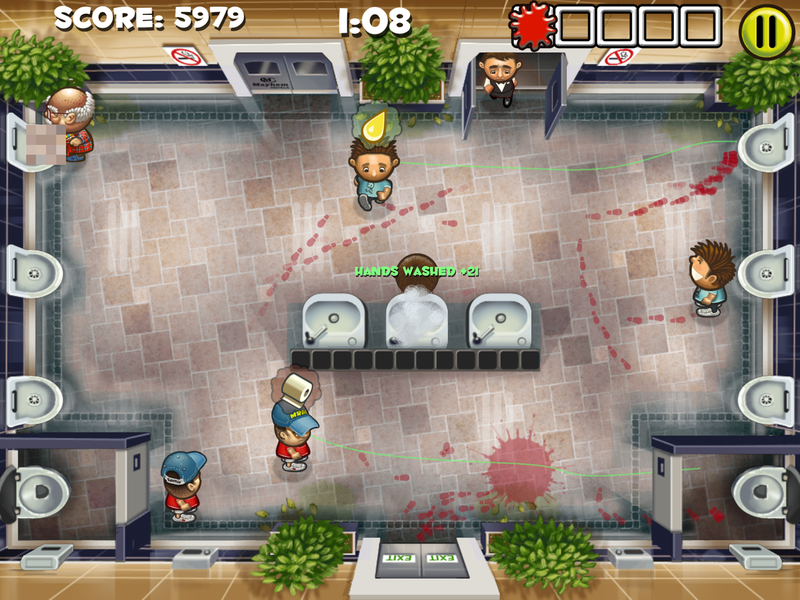 Enter Men’s Room Mayhem, an off-the-wall “bathroom simulator” that has to be seen to be believed. In this $1.99 downloadable game, you play as a bathroom attendant who is in charge of directing patrons to the proper urinal/toilet and then getting them out the door. Moving them to the sink to wash their hands is optional, but even in the digital world it feels dirty to not demonstrate proper hygiene. The characters that show up to the men’s room are a lively, varied bunch, including chefs, the elderly, drunks and even, gasp, a woman! Moving them around is as simple as sliding your finger across the screen, and this is basically a line-drawing game in the most bizarre form possible. If you run two characters into each other, they will fight, causing a bloody mess that sends them out the door together. If you don’t get a patron to the urinal (or toilet, if necessary), they will urinate on the floor and flee the premises. Naturally, these are not healthy options, and you don’t get any points for your failure as the attendant. The game is split into different waves, with each one growing increasingly more difficult than the last. As more and more men show up, the chances of provoking fistfights and unwanted messes increases tenfold, often creating a chaotic screen. If five incidents like this occur in one wave, it’s game over. There are two ways to play: normal or blitz mode. The normal mode has you pick a location (of which there are seven, ranging from hotels to disco clubs) and then partake in the regular round of waves. 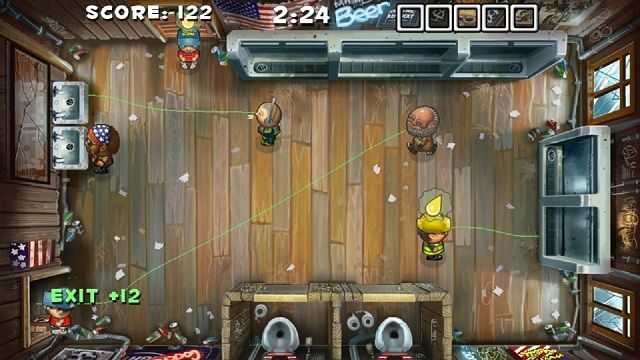 This mode also shares a number of in-game challenges (such as avoiding fights through three waves, or achieving a certain amount of “near misses”) to keep things fresh, but only three can be earned with each playthrough. This makes the process tedious at times, as it requires stopping and restarting the game in order to get a fresh set of objectives. Unfortunately, this is an inconvenience, and it feels like these were included to superficially extend gameplay length. Normal mode also starts off slow, with the first two waves requiring some serious patience to persevere. Each wave is only around a minute long, but the first two seem to crawl along since the bare minimum of patrons show up. By wave three, the pace quickens, but it would be nice to have the early stages just a tad more challenging. 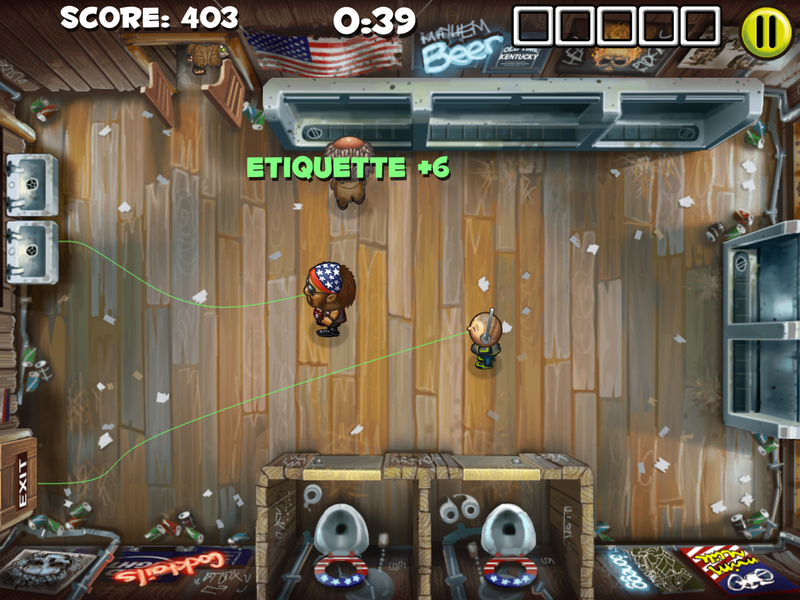 There are also “clean up” mini-games in between each wave, and these consist of frantically rubbing the screen in order to scrub the sinks and urinals, as well as mop up any blood and/or urine on the floor. I’m not a huge fan of these intervals, but they at least go by very fast. Blitz mode eradicates the pacing issue by just setting a three minute time limit and throwing character after character into the men’s room. For those looking for nothing but frenetic mayhem, this is the best option. If trophies are your thing, this has a decent amount of ’em. Most are pretty straightforward, with many revolving around serving specific characters or finishing mission objectives. Uhhhhhhhhh……now I don’t know which is weirder; this game or the one Sega developed in Japan that is a urinal and a video game in one. Hah, that’s a good question. I’m going to say the Sega game since it involves actually urinating, but both of ’em are pretty freakin’ bizarre. I… I have no words for this. Haha, I know what you mean. I thought it was a joke at first. I’m with John. You live in interesting times. That said. I’ve cast my votes for Best Vietnam War film with ‘Full Metal Jacket’ and ‘We Were Soldiers’. Honorable Mention(s) and other additions could be ‘Go Tell the Spartans!’, ‘The Siege of Fire Base Gloria’, ‘Flight of the Intruder’ and ‘The Odd, Angry Shot’. Hi Jack, thanks for chiming in on the poll! I was hoping to get your opinion on that. Will have to look up those you listed as honorable mentions, as I haven’t heard of any of them. I’ve always found films set during the Vietnam War to be fascinating though. Haha, that trailer is excellent. I really need to get around to getting a Vita soon (even though I suppose this is one title I could play on my tablet). Game looks fun in that uniquely bizarre way. Always fun to see what kind of crazy stuff indie developers can come up with since they’re not kept on a leash. Thanks man. Rumors are swirling that there will be a Vita price drop or some type of PS4 bundle announcement at E3. I’m hoping Sony reveals some big plans for the handheld.